Ever wondered if the Bible teaches care for God’s creation? 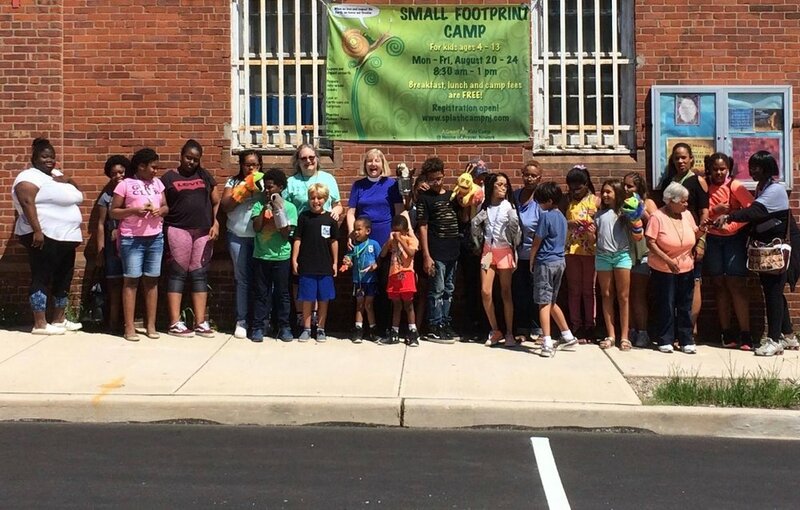 Betsy LaVela and her GreenFaith Kids curriculum offer a resounding, convincing “Yes!” For years her lesson plans have served as the foundation for week-long summer camps. Now, her vision has blossomed into a multi-unit curriculum geared toward Abrahamic faith communities for their kid/family classes. If you’re interested in Biblical narratives offering timeless lessons in ecology and sustainability, or you simply want the kids in your life to show a greater appreciation for the natural world, this curriculum is for you. Betsy’s vision began as a five-day, interfaith summer program called Splash Camp. The camp was the brainchild of Rev. Dr. Skip Vilas, a long-time activist in the Episcopal environmental movement, and Dr. Ali Chaudry, long-time leader of the Islamic Society of Basking Ridge. They were looking for a leader. As an undergraduate, Betsy had earned a double major in Biology and English from Wittenberg University, a liberal arts college in Springfield, Ohio. She had also recently completed her Masters of Divinity with highest honors at Bethel Seminary in St. Paul, Minnesota. Vilas and Chaudry recognized Betsy as a perfect fit, so they tapped her to create an experience appropriate for area kids from Christian, Jewish, and Muslim traditions. 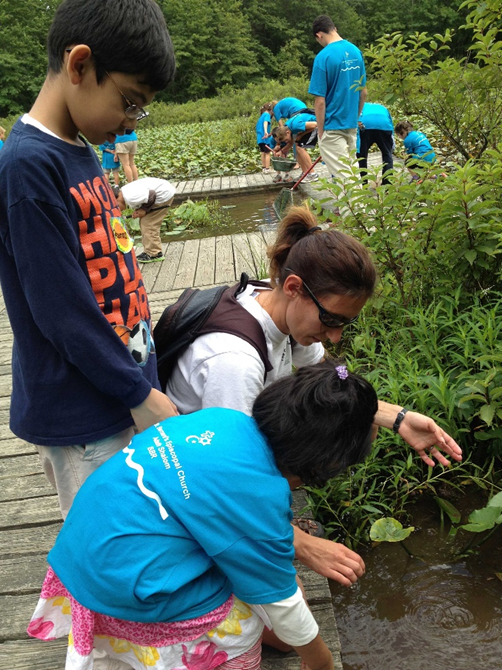 The first camp, offered in the summer of 2013, would focus on water science, Betsy decided. She used her extensive community-building skills to secure adult volunteers, involve teens, find guest speakers from the three Abrahamic religions, and to organize nature-based field trips. As Betsy said, “I just love leading camps. I can inspire people to work with me, I can come up with arts-and-craft ideas, I can add music, and I can find a sacred story that everyone can nod their heads to.” At the same time, adult faith leaders were meeting at nearby Drew University for their own interfaith programming. Clearly, the camp was meeting a growing need in a unique, important way. The next year, Betsy developed Critter Camp focusing on biodiversity. Since then, the program’s roots have grown to include units on Earth science, marine biology, and sustainability. Betsy began field-testing her curriculum by allowing other urban and suburban Christian churches to use her concept and materials. Last summer, her growing root system spread all the way to a community in Oregon! Betsy has also developed a more formal relationship with GreenFaith, an international, interfaith environmental NGO, and her curricular resources are now branded as GreenFaith Kids Camps. Betsy’s emphasis on educational camp experiences is currently morphing into a massive undertaking as she develops a GreenFaith Sunday morning curriculum that contains over 100 lesson plans! As Betsy put it, “When you know God has gifted you as an educator, you don’t sit on that gift.” The curriculum is sub-divided into eleven different themes: five R’s and six Gifts. The five R’s are: Reduce, Reuse, Recycle, Rethink, Repeat. The six Gifts are: Water, Forest, Critters, Ocean, Soil/Rocks, and Gardens. The smaller units contain 4-5 lesson plans each; the larger units contain 10-15 lesson plans each. The lesson plans, geared to kids age 4-13, are based primarily on passages from the Old and New Testaments of the Christian Bible, but a few lessons are based on narratives from the Jewish and Buddhist traditions. Nearly all lessons include an Icebreaker/Introduction, a Story, a Reflection period, and a final Prayer. Lessons also include various experiential elements, such as hands-on Activities, Cooperative Games, Art Projects, Song Ideas, or Object Lessons. As Betsy said, “One of the absolute joys … is seeing the combined impact of science, music, art, and storytelling.” Betsy also describes her curriculum as both modular and post-modern, which enables users from all three Abrahamic traditions to customize implementation in the real-world classroom. Betsy LaVela’s personal story makes her an ideal match for this vocational path – although it started, humbly enough, with some unhappy toddlers in the Netherlands. A life-long Episcopalian raising two children at the time, she ended up attending a non-denominational church in Amsterdam. On their first Sunday, a church member frantically asked Betsy for assistance. They had a room full of crying two-year-olds, and she looked like someone who had the necessary skills. They were right. Betsy knew exactly how to get those kids singing, playing, and laughing. Her long career as a religious educator had begun. She served as the Children’s Pastor at Crossroads International in Amsterdam under five different lead pastors, and she has been either the Children’s Pastor or the Director of Children/Family Ministry at both non-denominational and Episcopal churches in northeastern New Jersey. In 2017, visiting an interfaith school in Jordan helped her see her work “with new eyes” and opened her up making her curriculum more interfaith. She returned to the U.S. more committed than ever to making her materials appropriate for those of any/all religious beliefs. In addition to her faith-based work, Betsy is a gifted music teacher. She taught Kindermusic for many years and was recently recognized as Maestro of Outreach for her tireless efforts in sharing Kindermusic with all kids and families, especially those who might not typically have Kindermusic programming in their lives. Betsy is a GreenFaith Fellow and earned her certificate from their Leading the Change program. GreenFaith not only offers support and training. They also provide important connections with others interested in sharing the creation-care message. Betsy’s camps, for example, rely on volunteers. Many of those volunteers are affiliated with GreenFaith in some way, which means they arrive with some level of expertise, come from a variety of faith traditions, and represent a range of ages. Taken together, these experiences have given this woman a profound commitment to childhood instruction, an educational toolbox that is chock-full of best practices, and a deep appreciation for the importance of being flexible! Since Betsy’s curricula is both science-based and interfaith-friendly, it can be used by preschools, camp directors, faith-based communities, and home-school groups, leaving her quite busy. The camps regularly draw 25-40 kids per session, and she works closely with communities interested in using her curriculum. Betsy also continues to write and develop new lesson plans, and she’s currently working with an artist to create characters and graphics as she readies her work for publication. Betsy has also noticed something that we see regularly in interfaith work with kids. That is, it’s never just for the kids; adults love this stuff, too. As Betsy put it, “Some of my most memorable experiences have been the reactions of adults. When adults and teens come into contact with this, they begin to see things differently, and they become great ambassadors of the program.” Betsy is hoping to take advantage of this growing enthusiasm for nature and creature care by offering on-line trainings for prospective leaders interested in leading their own GreenFaith Kids group. For more information on Betsy and her camps, check out the Splash Camp website or contact Betsy Lavela at splashcampnj@gmail.com.